Christian population has tripled in Iraqi Kurdistan because of refugees! 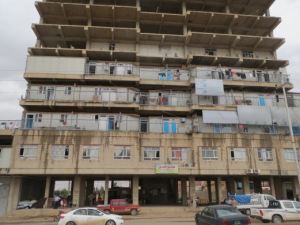 Conditions for Christians in northern Iraq: Dozens of skeletons of large multi-story buildings rise above the streets in Ankawa and Erbil, Iraq. Here, not so long ago, construction was booming. In fact, the city was about to be declared the number one tourist destination in the Middle East in 2014. Then suddenly, the Islamic State captured Mosul to the west and advanced to within 35 kilometers (15 miles) of Erbil. Construction immediately stopped on a dozen five star hotels, and all international flights into the huge airport were suspended. The shells of those unfinished hotels are now centers for Internally Displaced Persons (IDP’s). I was shocked to see the modular rooms that had been set up on the empty floors of the skeletal building. The stairs are bare, rough cement, and of course there are no elevators. Children play where they can, and dozens were on the stairs as our mission team climbed to the living areas. The modular units provide one room per family. There is no privacy for the adults, and wash rooms and toilets are located in common areas. For some individuality, the public kitchens have dozens of propane stoves so that women can cook for their own families. The conditions are sanitary but certainly not comfortable. Still, in the centers we visited the families considered themselves very fortunate, because 90% still had the men present. Husbands and fathers of the other 10% had been killed by the Islamic State or were missing and presumed dead in Islamic State held territory. Al-Amal Hope Center for the Displaced People of Nineveh is the official name of the building above. The owner gave up his plans to open the building as a hotel in sight of the airport and allowed it to be used as a refugee center. The building itself is actually located in Ankawa. The Kurdish military, known as the Peshmerga, has pushed the Islamic State back to twenty-five miles from the city, allowing flights to once again arrive and depart from the airport in Erbil serviced by Royal Jordanian Airlines. We stayed in Ankawa, which is actually a separate municipality from Erbil and is 99% Christian. NOTE: The Iraqi Army refuses to defend the Kurdish areas despite the fact that most Iraqi oil is pumped from there. The oil flows to southern Iraq, where the Iraqi government has refused for two years to give any of the money from the sale of the oil to the Kurds. The official position of the United States is to NOT allow the Kurds to sell their oil to buy weapons to protect themselves, despite the fact that the Iraqi government will not protect or arm them. Ashti is a refugee camp sanctioned by the United Nations and is also located in Ankawa. Virtually all of the residents in this caravan town are Christians and most of the trailers have crosses on the door, or larger one’s erected on the roof. Every one of the caravans or trailers are identical, but at least each has its own kitchen and bath. Most camps have common cooking and sanitary facilities. 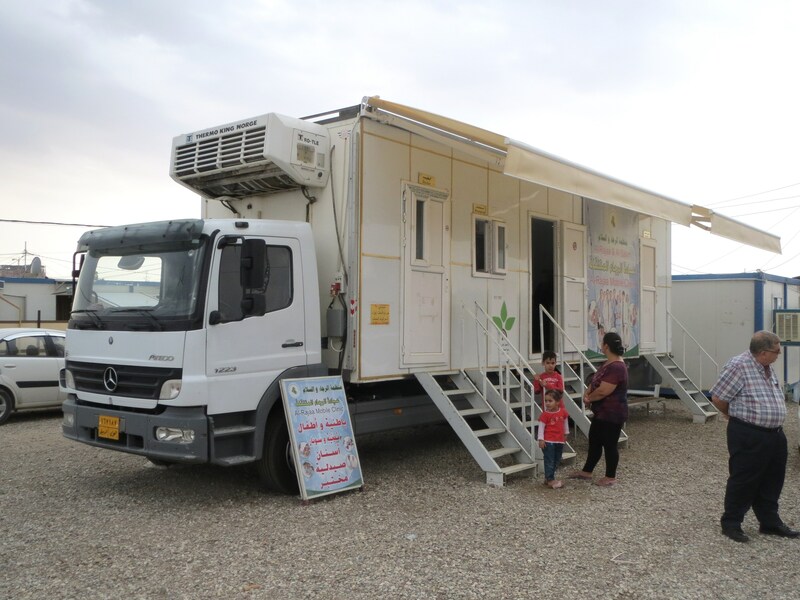 The modular homes do have air conditioning units, but the power in the camps and all of the Kurdish area is unreliable because of the huge population increase that was NOT accompanied by building any more infrastructure. On days when the temperatures exceed 100 degrees, there is power for less than 15 or 16 hours per day. During my stay the high was 107. The families are so crowded together there is virtually no privacy. While there I saw some newly arrived men climb onto the roofs of their trailers and just stand there. Some told me they would be better off outside the camp because they could earn some money. 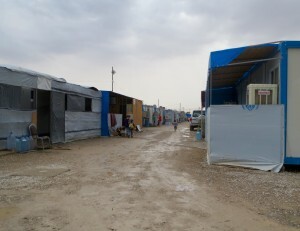 Inside the camp, families are 100% dependent on aid. Ashti Camp is still growing, and on the day I left had 1,057 families totaling 6,500 people, about half of whom are children who are not attending school. The only medical care available is at a hand-built mobile clinic furnished by a ministry. The doctor who took the responsibility of outfitting the truck got estimates of $600,000 to build it. He and ministry members used an old Mercedes truck frame and restaurant refrigeration units, and built it for $80,000 in donations. The al-Rajaa mobile clinic has a dentist, two doctors, a pharmacy and a testing lab, all on one truck frame. Some of the stories of the misery these families went through are heart breaking, but still the vast majority of the families are intact, which is in itself a miracle. The tragic waste of human ability and knowledge is stunning. Both Iraq and Syria were emerging nations with 99% literacy and a large middle class. Among those idled in these camps are skilled technicians, medical workers, teachers – even professors, shop owners and in one case a land developer. Now they sit watching TV while their children, who once studied in private Christian schools, play in the dirt outside their trailers. Sadly, much of this devastation can be laid at the door of the White House and its miserably failed Middle East policy. 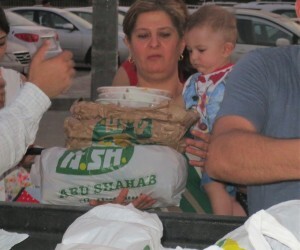 Our first dinners in Iraq: The major purpose of my mission to Iraq in September was to determine if we could expand our Christmas programs for children to Iraq. Because of the almost constant daily bombings in Baghdad, that city was ruled out immediately. Bringing hundreds of Christian children to one location there would be inviting disaster. Kurdistan is relatively untouched by Islamic terror, other than the constant attempted advance of the Islamic State army. Only a few years ago the population of Erbil, the capital of the Kurdish region of Iraq, was just 1.5 million. As mentioned above, the population is now twice that number. Terror bombings are rare — the last one occurring on April 18th at the U.S. Consulate, which looks more like a military compound than a consulate. Our events will be held in Ankawa which is an independent municipality that is 99% Christian, with a 100% Christian police department. During my September mission trip we held two events with meals and faith building programs for the kids, as well as a week’s worth of food for each family. (A third event in Kirkuk had to be cancelled because of military activity on the road to that city). We became convinced that the ministry we had contracted would be able to move hundreds of people to an event, have a program for them, and return them safely to their homes. In one instance we successfully moved 230 people from their camp to a park where a trade and book fair was taking place, fed them hot meals and returned them home. There were some mistakes, as this was a learning effort. In the case of the park event, it was on a day when the temperature reached 107, and the meal had to be served late. By the time the distribution was complete, it was difficult to locate the families because they had spread out in the park. This is understandable, as these refugees are literally on top of each other 24 hours a day, and a chance to separate and have a private family meal in a cooler outdoor setting was a welcome relief for many. Fortunately, all managed to make it back to the buses! The second event went well for everyone — other than our photographer, who had a corrupted SD card and lost all of the photos. Many photos from the first event were lost as well. The ministry groups we worked with are small compared to the giant organizations you may be familiar with. Larger aid organizations, even those with Christian names, accept funds from the European Union and U.S. government agencies, and as a result are required to assist ten times as many Muslims as Christians. That is precisely the reason the Religious Freedom Coalition does not accept government grants. In the Kurdish region of Iraq where Erbil is located, our partner organization is (name redacted), an organization like ours that does not accept EU or USAID funds. This group has constructed two meeting centers and has a third under construction for the only purpose of ministry to Internally Displaced Persons (IDP’s) or those commonly called refugees. I have inspected the sites and they are perfect for the Christmas dinners we are planning in Erbil. Christmas events will be held in Iraq: It was clear to me that our ministry partner there has even greater capacity than what is needed for the Christmas meals for the kids. They demonstrated the ability to organize hundreds of refugees at once, transport them and feed them while providing a program for them. As this will be our first attempt at holding the events in Iraq, we will not be hosting nearly so many families as in Jordan and Lebanon, where thousands of families are served by Christmas for Refugees. Iraq this year will be limited to about 1,000 children aged six to twelve. The half day Christmas events will include transportation, puppet shows, games and activities such as Christian themed coloring books, singing carols and of course a hot Christmas meal. Each family will be given enough food for about one week. Congress is back: Those readers who have recently sent post cards to Congress demanding a halt to the funding of Islamic fighters should be getting replies. Please send copies to our office. Their replies are a real help to us in discussing with congressional staff exactly how far off base their office is on the issue. Legislative Coordinator hired by RFC: There are 435 members of Congress and 100 Senators. Each of those have from ten to twenty staff members to deal with. In September, an additional RFC staff member was brought on board to help deal with Members of Congress. Our aid work in the Middle East is small in comparison to the enormous need, but it is important. However, our core work on Capitol Hill must continue. The two efforts go hand in hand. Our humanitarian work in the Middle East gives us an edge in dealing with congressmen and Senators. A lot of advocacy groups with opinions about the Middle East have no presence there and no real knowledge about the situation other than what they can find on the Internet. When someone from our office is talking, or writing, to a congressman or Senator, we can quote on-the-ground sources with whom we are in contact on a daily basis. I can look a Senator in the eye and say, “I talked to the women who were used as Muta (temporary wives allowed by Islam) for Islamic fighters. I have been there. I have seen firsthand the needs of the children and how the refugees really feel about our nation’s involvement. I have the evidence to prove what I am telling you is true.” Being able to make that statement gives me the ear of congressmen and Senators and a level of credibility which few others have. Each month tens of thousands of people read the Chairman’s Report at our Internet site. Of those tens of thousands about ten (10) make donations on the Internet. If you are one of those who read this material and support us in spirit and prayer, I would ask that you also consider financial support this month. Thank you!